"From the minute I walked into your office I felt at ease and treated with warm, caring respect. My whitening procedure went smoothly. I was extremely pleased after having old, yellow, smoke-stained teeth looking almost like new again. Thanks for giving me my smile back again." "I am thoroughly pleased and amazed at the level of professionalism, efficiency, and caring displayed by each and every staff member. The attention to detail and commitment to advanced technology is always appreciated. I would be remiss in not heaping large doses of praise for the interior design and decoration of the office suites." "A trip to the dentist is not on the top of anybody’s list but Dr Murray and his staff are outstanding and I couldn’t imagine going anywhere else." "No issues. Hands down the best dental experience I have had. It amazes me that after 6 months, the staff knows your name and everything you told them from the last visit. Truly and excellent experience." "I have no concerns, only praise at Exceptional Dentistry. I never thought in my wildest dreams I would ever look forward to a dentist appointment…but I actually do!!!" "There were no issues or concerns. Actually I just wanted to mention that I had to take my 4 year-old daughter and everyone went out of their way to make her feel comfortable…thank you!" 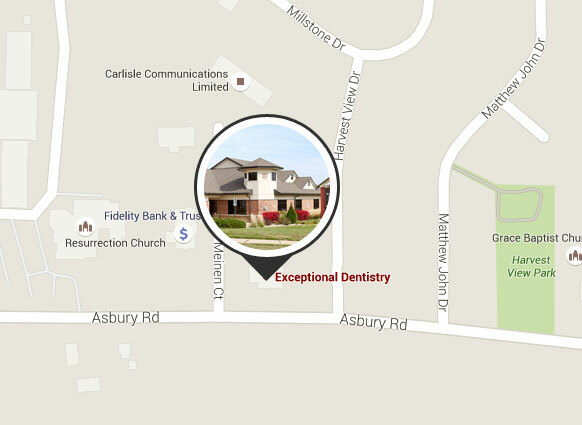 "Your office is very pleasant and everyone there definitely has “patient service” in mind. I am always impressed with the professionalism offered by everyone on the team." "We have ALWAYS been very pleased with the reception and care when in the office. We have been patients for many years (20+) and have been recommended Dr. Ted’s practice to newcomers to the city." "Dr. Ted Murray and Dr. Kristen Berning along with their friendly staff have made ‘going to the dentist’ a trip I now look forward to"